Have you heard about this New Year’s Eve’s hottest fashion trend? It’s a cocktail dress paired with a giant bib, a.k.a. 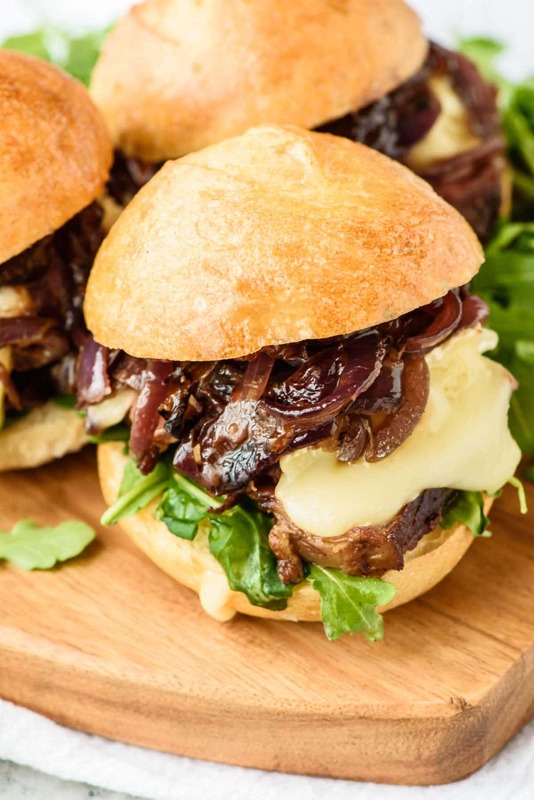 the ideal ensemble for devouring a Mini Steak Sandwich with Brie, Caramelized Onions, and Fig Jam. Preheat the oven to 350 degrees F. Remove steak from the refrigerator and place on a plate. Season liberally with salt and pepper on both sides. Let come to room temperature while you caramelize the onions. Prepare the Dijon onions: Heat 1 tablespoon olive oil in a large sautee pan over medium high. Add the sliced red onions and 1/4 teaspoon kosher salt. Cook until the onions begin to soften and brown, 5-8 minutes. Reduce heat to low and let cook, stirring occasionally, until the onions are very soft and caramelized, about 15 additional minutes. Remove from heat and stir in the Dijon to evenly coat. Remove the onions to a plate or bowl, then gently wipe the skillet clean with a paper towel. Heat the remaining 1 1/2 tablespoons olive oil in the skillet over medium high. Once the oil is very hot and almost smoking, add the seasoned steaks. Do not crowd them—if your skillet is not large enough to easily accommodate both, cook them in batches. Sear the steaks for 1 minute on each side, then reduce the heat to low and cook the steak for about 6-8 minutes, turning once, until rare and a thermometer inserted in the center reaches 125 degrees F. Transfer to a plate and cover with foil. Let rest for 10 minutes, then slice into strips. Spread the melted butter onto the bottom of a 9×13-inch baking dish, using just enough to coat the pan. 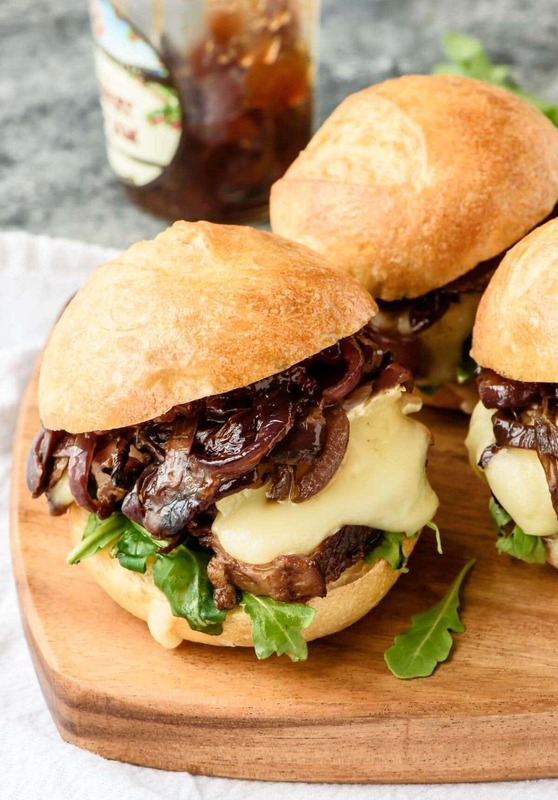 Lay the bottom of the buns in a single layer in the baking dish, then top with the arugula, steak slices, Brie, and the caramelized onions. Spread the inside of the top buns with about 2 teaspoons jam, then lay the buns on top to complete the sandwiches. Brush the bun tops with the remaining melted butter, then cover the pan with foil. Bake for 15 minutes, just until the cheese has melted. Transfer to a serving plate and enjoy warm. *Feel free to substitute the strip steaks for another cut of beef you enjoy. Sliced tenderloin would also be fantastic. Make-ahead tips: The Dijon onion topping can prepared and stored in the refrigerator up to 2 days in advance. Whole sandwiches can be assembled, arranged in the pan, and kept at room temperature for 1-2 hours in advance. Bake just before serving. 0 Response to " Mini Steak Sandwich with Brie, Caramelized Onions and Fig Jam"